Now that Septimus, Jenna, and Beetle are fourteen years old, they have assumed larger roles in their Magykal world. Beetle is the Chief Hermetic Scribe of the Manuscriptorium and Jenna will soon be Queen, but Septimus is still battling the remnants of the Darke Domaine, which will remain until the power of the evil Two-Faced Ring is destroyed forever. To accomplish that, the ancient Alchemie Fyre must be relit—a task that sends Septimus to the very origins of Magyk and Physik, testing both his skills and his loyalties to ExtraOrdinary Wizard Marcia Overstrand and Alchemist Marcellus Pye.In a journey that encapsulates the entire Septimus Heap series, Septimus continues to discover who he is and expand upon his Magykal power and skills. fyre weaves together every character from the series and incorporates many of the Magykal places from each book. 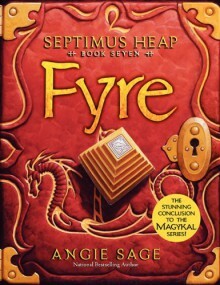 Written with Angie Sage's distinctive humor and heart, Fyre is the grand finale that celebrates the greatest Magyk of all: When the Fyre inside is kindled and when the Time Is Right, anything is possible. The last of the 7-book series, and a satisfying wrap up of most of the hanging story points. Like the others, it moved along quickly and propelled the characters into and out of interesting situations. Sage resists the urge to pair everyone off at the end, for which I'm grateful.